In a previous post, I talked about how the idea of life on Mars captivated the mind of the world before the space age, and left off with the arrival of Mariner 4. Now, with the Phoenix landing coming up on Sunday, I thought it would be fitting to continue the story of the search for life on Mars by looking at what past spacecraft have found. When Mariner 4 arrived at Mars, nobody knew what to expect. Would we catch our first glimpse of the famous canals? A view of the Martian seas? Great black mats of lichen blanketing the landscape? No. The 21 pictures from Mariner 4 revealed a dead world pock-marked by craters and remarkable similar to the moon. Those 21 pictures changed the way people looked at Mars. People no longer hoped to spy on a dying civilization, and talk turned to speculation about liquid water beneath the surface and microbe-level life. Mariner 9, the first spacecraft to orbit another planet, changed out view of Mars again. When it arrived, the planet was swathed in dust, and the only features visible were the towering peaks of the Tharsis volcanoes. As the dust settled and the spacecraft began to map the surface, it revealed that mars was not always a dead, moon-like world. 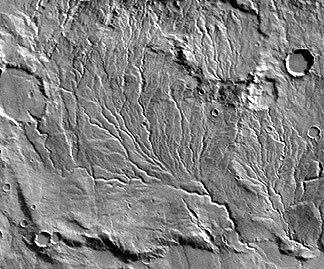 Evidence of volcanism and tectonics showed that Mars was once more geologically active, and the discovery of river beds and outflow channels proved that while the surface appeared dry and desolate, there was once flowing water on the surface of Mars. With the discoveries of Mariner 9, talk of life on Mars became more optimistic again. Maybe there was not a lot of life now, but perhaps if there was flowing water, Mars was once much more hospitable in the past. NASA therefore sent not one, but two impressively outfitted missions to study Mars from orbit and to land on the surface. Viking 1 and Viking 2 each consisted of an orbiter and a lander. The orbiters mapped the entire surface of the planet, revealing many more water-carved features, but in terms of the search for life, the action happened on the surface. 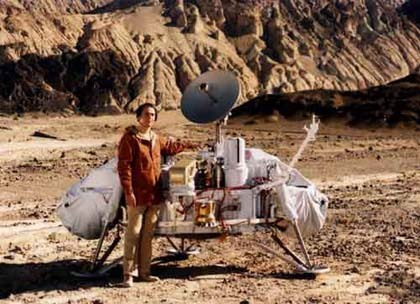 Each Viking lander was equipped with a suite of instruments and experiments specifically designed to answer the question of whether or not there is life on Mars. Let’s work through each of these and talk about what they did and why. The first of these, the Labeled Release experiment, used the robotic arm to place a soil sample into an incubation chamber and then a broth of water and nutrients were added. The nutrients contained the radioactive carbon isotope Carbon-14. The idea was, if there was any life in the soil, it would metabolize the C-14-bearing nutrients and release gases “labeled” by the radioactive carbon, which could then be detected. When this experiment was actually run on Mars, immediately after the nutrient broth was added, tons of C-14-bearing CO2 was generated. Life on mars! Hurrah! Just to test, the experiment was done again, but the sample was heated first to sterilize it. The heated sample did not give off any labeled gases. All signs pointed to life in the soil! The gas exchange experiment was also based on the premise that life in the soil would give off certain gases. A soil sample was submerged in a broth of nutrients, incubated for 12 days, and the composition of the atmosphere in the sample chamber was monitored. The results of this experiment were promising at first: the soil samples gave off oxygen when exposed to the nutrients. Unfortunately, the soil also gave off oxygen after being cooked and sterilized. The third experiment, the pyrolitic release experiment, actually simulated mars conditions rather than impsing earth-like (aka wet and nutrient-rich) conditions on the sample. The soil was placed in the experiment chamber and exposed to a CO2 atmosphere that had been doped with C-14. Then, after several days the whole chamber was heated to a high enough temperature to “pyrolize” or break apart any organic compounds present. If the gases generated when the oven was heated contained and C-14 it would indicate that something in the soil was metabolizing the C-14 atmosphere. This experiment was confusing. In both the unsterilized and sterilized cases, the sample released C-14. The fact that carbon was released even when the sample had been cooked beforehand implied that some non-biological process was probably responsible for the released carbon. The final experiment was the gas chromatogram / mass spectrometer, or GC/MS. A gas chromatogram is an instrument that measures gas composition by separating the components of a gas based on some chemical property. By passing the separated components into the mass spectrometer, which can very precisely measure the mass of the gas molecules (or molecule fragments), the GC/MS can accurately determine what types of molecules there are in the sample. GC/MS is especially good at detecting organic or carbon-bearing molecules. The GC/MS on Viking should have been sensitive enough to detect even the minute amount of organic molecules from infalling meteors and comets, but if found nothing. Zip. Zero. Zilch. Nada. No organic molecules at all. The Viking results were confusing, but eventually most scientists converged on the idea that the “positive” results of the labeled release experiment and the ambiguous results of the gas exchange and pyrolitic release could be explained by non-biological chemical reactions. Still, some scientists have revisited the results, suggesting that perhaps the GC/MS was not as sensitive as everyone thought, or that maybe the organic molecules on Mars were not present in a form that could be vaporized and sent into the GC/MS. The controversy has raged since the 1970s because none of the subsequent landers has had any instruments to detect organic molecules. All of that will change on Sunday if the Phoenix mission lands successfully. Among its suite of instruments, Phoenix is carrying a mass spectrometer. It also has a robotic arm and will be analyzing icy soil samples. With its mass spectrometer, it may finally find the “missing” organic molecules on Mars. Or perhaps it won’t. Either result will be extremely important. We’ll just have to wait and see. This entry was posted on May 22, 2008 at 2:14 am and is filed under Astrobiology, Phoenix, Pictures, Water on Mars. You can subscribe via RSS 2.0 feed to this post's comments. Both comments and pings are currently closed.